School leavers aged under 18 will not be eligible for welfare benefits and will instead be offered free further education or training under a National Party scheme to be unveiled today. The Press understands National leader John Key will use his state-of-the-nation speech in Auckland today to unveil a "youth guarantee" scheme that will provide 16 and 17-year-olds with a universal educational entitlement. The speech to party faithful at Ellerslie at lunchtime today will officially kick off election year. Prime Minister Helen Clark will follow Key tomorrow with a speech outlining her Government's plans. And so Helen should, National need to encroach on the female vote and education for kids is real bait, yes there is some stick involved re canceling any benefit if kids don’t turn up, which of course is more likely to entrench those kids into crime and poverty than force them into training but the sheer contempt most NZers (especially National voting NZers) hold young people in will drown out any criticism. 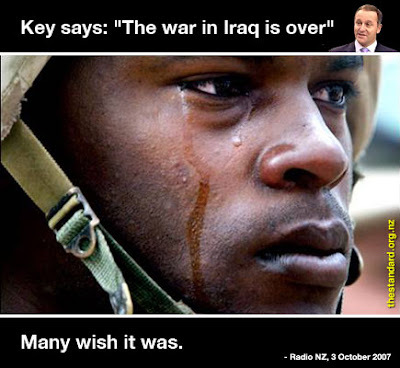 It is smart politics and reinforces the wisdom of Helen going right after John Key in an attempt to drown him out. WHAT ABOUT THE RECENT "PEOPLE'S CENTRE" VICTORY OVER WINZ DENYING TEENS THE DOLE? There you go. Sounds reasonable to me. Lets see how much hate and bile Bomber can spew at this.